Erin, a world champion LumberJill athlete, and Chance a Navy SEAL have never been new to fitness and making it happen. Predation CrossFit was founded out of necessity. After trying to workout at other gyms, we discovered something was missing. The big gyms wouldn’t allow us the freedom to train our way, but the smaller gyms lacked personality and attention to detail. 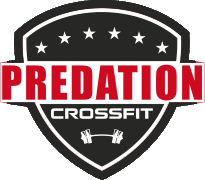 At Predation, we train on multiple levels of fitness and create a program that can be tailored to every athletes personal goals. Whether that’s the stay-at-home mom, the college student or the professional athlete, we promise to help you develop your fitness. Ultimately, we just want to hike, bike, ski, and live for as long as we possibly can. If you’re new to CrossFit, a Veteran, or someone who just has questions about this type of lifestyle, come in to Predation CrossFit and let us show you what we’re made of.